You'll be able to add your wack easily-from any page on the Wacktrap website. If you're ever feeling lost, remember: we always keep that Add a wack link at the ready in the top navigation bar, and it's not movin'. Adding a wack is easy stuff. We provide lots of options, but only three simple things are required: Category, Title and wack body text. 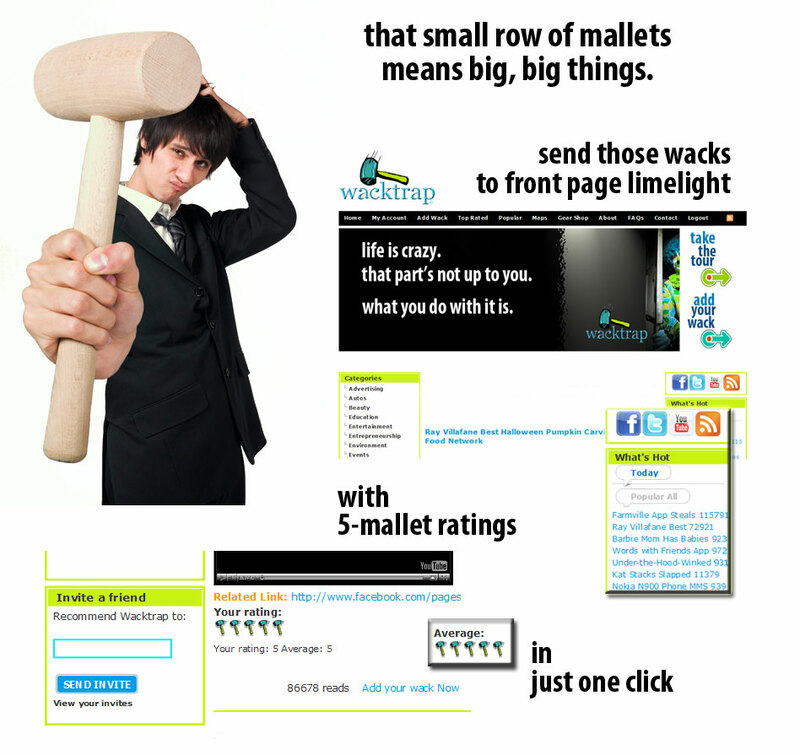 You've gotta Register with Wacktrap to add your wack-and we make it easy. Don't worry, we won't ask you for tons of info-just the basics, so you can get started right away. To add your wack, first select your Category from the dropdown menu. If you can't find the Category that fits your wack please contact us. If the perfect spot for your wack doesn't yet exist, we'll make it happen-and as quickly as possible. If it's not fittin', let us know, so your wack can always be easily found. You'll be needin' a great wack Title. Remember, the sole purpose is to help members find-and see-your wack. We'll show you how to how to create great wack Titles for the most findable wacks. You'll want to cap the first letter only in every word of your Title, not every letter. You'll want to stay away from those short and irrelevant words that only block users from locating your wack. And remember that Keywords are crucial, both in your Title and your wack. So don't be cheap with use. Use keywords in your Title and text, and use 'em consistently. After all, you want to make it as easy as possible, for members ot find that wack so they can promote it to the Wacktrap home page. You'll be pluggin' all the details into the body. The text area is expandable, so you'll have all the room you need to create your wack. The body or text of your wack can be any length. Make it as detailed as you like, just be sure to provide us at least 10 words or more. If you've got images, share 'em. When you're creating your wack, we give you spots for the following optional stuff: you'll want to add a photo, video clip, url or document to your wack when you can, to boost your wack's 'must-see' factor. You'll also rack up Wack Stats fast, but most importantly, members want to see those incredible pics or video clips that make the best wacks even better. We've added one extra option for wacks related to businesses: plug in the Location Name and, if you've got it, the physical address for wacks related to a company or business. Don't forget to fill out these optional fields, whenever you've got the info. It'll make your wack more findable, especially for members who share wacks in the same Category or with the same company. You might even make a great Connection or two, simply by filling in these few lines.